The 2011 Tohoku earthquake off the Pacific coast of Japan was the largest earthquake since the setup of a high-density seismic network in Japan. This network has recorded a change in seismicity patterns after the Tohoku earthquake, with seismicity increasing in a number of areas, including the southeast of the Tohoku region. Here, we present new research into shear-wave splitting during crustal earthquakes within this area of newly-activated seismicity by comparing shear-wave splitting before and after the 2011 event. In the pre-2011 Tohoku earthquake dataset, polarization azimuths within the area of newly-activated seismicity and the region immediately surrounding this area were almost NNE-SSW and ESE-WNW, respectively. Post-2011 Tohoku earthquake data in the same area also records a NNE-SSW polarization azimuth direction. Data with an ESE-WNW polarization azimuth most probably relate to the regional stress field in the area associated with the westward subduction of the Pacific Plate; however, data from the area of seismicity-activated with NNE-SSW polarization azimuths are inconsistent with the expected regional stress field. Our shear-wave splitting analysis suggests that the orientation of the maximum stress axis in the area that underwent activation in seismicity did not change significantly after the 2011 Tohoku earthquake. The 2011 Tohoku earthquake was a magnitude 9.0 earthquake that occurred off the Pacific coast of Japan on March 11, 2011, offshore of the Tohoku area. This earthquake occurred along a plate boundary where the Pacific Plate is being subducted to the WNW beneath the Japanese Islands along the Japan Trench at a velocity of 3–5 cm/year (e.g., Seno et al., 1993). The 2011 Tohoku earthquake was a subduction-type earthquake that occurred along the entirety of the Japan Trench, and was associated with a 400-km-long and 200-km-wide fault (e.g., Asano et al., 2011). In Japan, a high-spatial-density seismic network was recently constructed to cover the entirety of the country at an average spacing of about 20 km (Okada et al., 2004), and the 2011 Tohoku earthquake was the largest seismic event since the establishment of this network. A number of differing rupture process models have been presented for this earthquake (e.g., Fujii et al., 2011; Ide et al., 2011; Yoshida et al., 2011), and a large slip of >40 m was estimated to have occurred close to the trench at the plate boundary during the earthquake. Seafloor geodetic observations also provide evidence for a large slip (Sato et al., 2011). Aftershocks were distributed between 36°N and 40°N over an area 200 km wide, with 3 large M > 7 aftershocks occurring within one hour of the main shock. The 2011 Tohoku earthquake had a significant effect on the Japanese Islands. In Japan, a high-spatial-density Global Positioning System (GPS) array operated by the Geospatial Information Authority of Japan (GSI) recorded a very large eastward movement in the Tohoku region, with a maximum displacement at the eastern coast of the region of 5.1 m (Ozawa et al., 2011). The seismicity pattern in the eastern part of Japan also changed after the 2011 Tohoku earthquake (Toda et al., 2011b). This change is complex, with seismicity increasing in some areas and decreasing in others; these changes indicate that the significant deformation caused by the 2011 Tohoku earthquake resulted in a marked change in stress fields in Japan (Toda et al., 2011a). The southeastern Tohoku area, consisting of the northern part of Ibaraki prefecture and the southern part of Fukushima prefecture, is an area that underwent a significant change in seismicity after the 2011 event (Imanishi et al., 2012). Prior to this event, this area had a low background level of seismicity; however, after the earthquake, this area became seismically active with an increase in seismicity over an area of 50 km (north-south) × 30 km (east-west) (Fig. 1). The majority of earthquakes after the 2011 Tohoku earthquake have normal-fault-related focal mechanisms. In comparison, only a few seismic events occurred in the area prior to the 2011 Tohoku earthquake, with the majority of these events being small. The focal mechanisms were difficult to determine. A few magnitude >3 earthquakes occurred in the west of the study area, and were associated with reverse faulting along an E-W compressional axis (Kato et al., 2011; Imanishi et al., 2012). 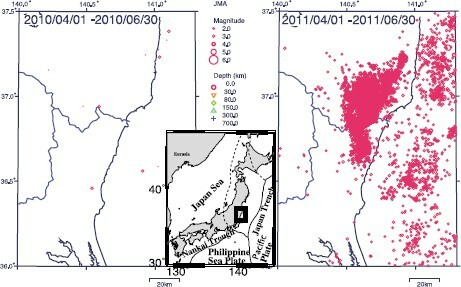 Map showing the seismicity of the southeastern Tohoku region, with seismicity maps for before and after the 2011 Tohoku earthquake shown on the left and right, respectively. The inset shows the location of the study area. The stress field in the shallow crust in Japan has been studied previously, with Kaneshima (1990) reporting that the maximum stress axis in northeastern Japan had a WNWESE orientation, parallel to, and potentially controlled by, the subduction direction of the Pacific Plate. This observation is consistent with reverse fault-related earthquake focal mechanisms obtained during previous research (Kaneshima, 1990). In the northern Ibaraki and southern Fukushima areas, focal mechanisms of earthquakes after the 2011 Tohoku earthquake are normal-fault-related and have tension axes oriented E-W, which is inconsistent with the stress field in this area documented by Kaneshima (1990). This suggests that the stress field in northeastern Japan was changed by the large displacement caused by the 2011 Tohoku earthquake. However, it should be noted that the form and orientation of the stress field in this area prior to the 2011 Tohoku earthquake was uncertain, primarily due to the very low seismicity of the area. Shear-wave splitting is an ideal tool for determining the orientation and form of the stress field in an area. Shear-wave splitting in the crust is related to the orientation of faults or cracks, and it is thought that propagating cracks are preferentially aligned parallel to the orientation of the maximum stress axis, in turn meaning that the polarization direction should also be parallel to the maximum stress axis (Crampin, 1981). This method can also be used to determine the stress field in areas with low seismicity. Here, we determine polarization directions using data for earthquakes that occurred both before and after the 2011 Tohoku earthquake, with stress field changes estimated using shear-wave splitting analysis. Temporal changes in the pattern of the lateral polarization direction were also analyzed during this study. 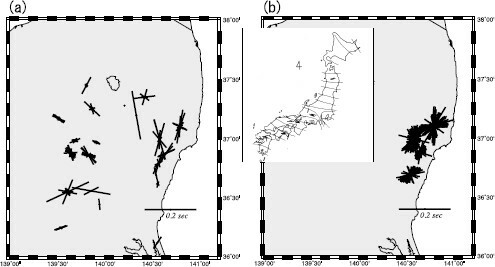 We analyzed crustal earthquakes at depths of <;25 km during this study, and formulated two separate datasets: before and after the 2011 Tohoku earthquake (Fig. 2). Dataset 1 consists of earthquakes that occurred from January 1, 2001 to Nov. 1, 2009, with dataset 2 consisting of earthquakes that occurred from June 1 to Sep. 30, 2011. We did not include earthquakes that occurred between March 11 and May 31, primarily because many large M > 5 earthquakes occurred in this area, and these events may have disturbed the local stress field. 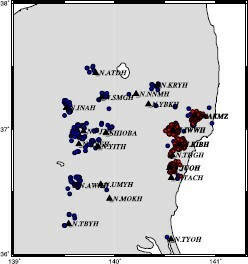 A total of 1102 earthquakes were used in this study, with 250 earthquakes in dataset 1 and 852 earthquakes in dataset 2. The 21 seismic stations operated by the National Research Institute of Earth Science and Disaster Prevention (NIED), the Japan Meteorological Agency, and the University of Tokyo, were used. The sampling frequency of the data was 100 Hz. In the analysis of the shear-wave splitting, the incident angles of the earthquakes need to be small. To ensure this, only earthquakes with epicentral distances of <10 and <5 km were included in datasets 1 and 2, respectively. Map showing the location of earthquake epicenters used in this study. Earthquakes that occurred before and after the 2011 Tohoku earthquake are shown as blue and red circles, respectively. Shear-wave splitting is expressed using two parameters: the fast polarization azimuth (ϕ, in degrees) and the time-lag between the fast and slow components of the split shear wave (τ, in seconds). Shear-wave splitting was investigated during this study using the same technique as that employed by Fukao (1984), where observed S-waves are divided into two orthogonal components. This process starts with the identification of S-phase waves within the waveform, followed by band-pass filtering using a 1–12 Hz frequency window. The two orthogonal-component waveforms are then rotated at 1° azimuthal intervals, with cross-correlations between the two waveforms calculated for each individual time and with a 1° azimuthal interval (Fig. 3). The time lag τ and the fast polarization azimuth ϕ are defined as the values that yielded the maximum correlation; only data with cross-correlation values of >0.7 were considered. Examples of waveforms recorded at two stations (A and B). Waveforms with N-S and E-W components are shown in (a), with maximum cross-correlation waveforms shown in (c). Original and anisotropy-corrected particle motions are shown in (b) and (d), respectively. In the case that the polarization direction was parallel or perpendicular to the direction of the incident-wave swing motion, it was very difficult to detect the anisotropy. However, the mechanism solution is not uniform, there is some variation of the mechanism (e.g. Imanishi et al., 2012), Then, we can detect the anisotropy of the area using the method. The results of shear-wave splitting analysis of datasets 1 and 2 are shown in Fig. 4(a) and (b), respectively, with a polarization direction rose diagram shown in Fig. 5. The shear-wave splitting data for earthquakes prior to the 2011 Tohoku earthquake are laterally variable, with E-W or WSW-WNW polarization directions in the western part of the study area and with most time-lag values being <0.1 s. In comparison, polarization directions in the eastern part of the study area (which showed newly-activated seismicity after the 2011 event) are N-S or NNE-SSW oriented, with time lags of 0.1–0.2 s. Shear-wave splitting in the eastern area was measured using dataset 2, yielding approximately N-S or NNE-SSW polarization directions. Low levels of seismicity precluded the detection of shear-wave splitting values for dataset 2 in the western part of the study area. Crustal earthquake S-wave polarization data for earthquakes shown in Fig. 2. Polarization azimuths and time delays between maximum and minimum phases are indicated by bar direction and length, respectively. 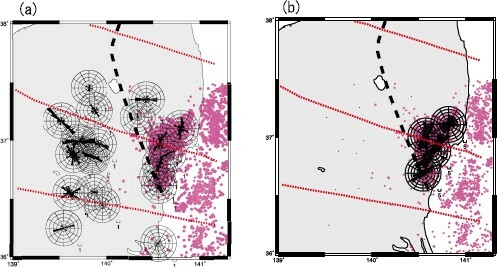 Data are plotted at the location of the seismic station from which they were obtained, with shear-wave splitting data of earthquakes before and after the 2011 Tohoku earthquake shown in (a) and (b), respectively. The inset shows the orientations of the maximum stress axes (Kaneshima, 1990). Rose diagrams showing the distribution of shear-wave-splitting fast directions determined using the cross-correlation method. Earthquakes before and after the 2011 Tohoku earthquake are shown in (a) and (b), respectively. Red circles represent epicenters of earthquakes that occurred after the 2011 Tohoku earthquake (shown in Fig. 1(b)), indicating the extent of the area of increased seismicity. Red dotted lines indicate the maximum stress-axis direction (Kaneshima, 1990) and the thick black dashed line is the Tanakura Tectonic line. A significant amount of lateral variation in polarization directions existed in the study area prior to the 2011 Tohoku earthquake, with N-S and E-W polarization directions in the area that underwent activation in seismicity and in the surrounding area, respectively. North-south polarization directions were observed both before and after the 2011 Tohoku earthquake in the area that underwent activation in seismicity, indicating that shear-wave splitting polarization directions in this area did not change significantly after the 2011 event (Table 1). Comparison of the shear-wave splitting results between before and after the Tohoku Earthquake. The averaged and standard deviation (S.D.) data of the polarization direction (ϕ) and time-lag (τ) are shown. We first consider the implications of point (1). Previous studies have estimated the stress field in the Tohoku area, suggesting that this area had an almost WNW-ESE maximum stress axis prior to the 2011 Tohoku earthquake (e.g., Kaneshima, 1990), parallel to the subduction direction of the Pacific Plate. This suggests that the WNW-ESE orientation of the maximum stress axis was caused by the motion of the subducting plate. Earthquake focal mechanism solutions determined by the Full Range Seismograph Network of Japan (F-net) of NIED for this area indicated dominant reverse-type faulting along an E-W compression axis (Imanishi et al., 2012). These focal mechanism solutions are consistent with the regional stress field in the area, with the polarization direction in the western part of the study area also consistent with a WNW-ESE stress field. The polarization direction of the study area can also be explained by plate motions, barring the eastern area (i.e., the area that underwent activation in seismicity). Analysis of the data obtained from this eastern area indicates a different polarization direction to that in the surrounding area. To explain the observed shear-wave splitting in the area with newly-activated seismicity, we need to consider other models. We next consider the implications of point (2). Prior to the 2011 Tohoku earthquake, only low levels of seismic activity occurred within the study area, with normal-fault-related earthquakes occurring after the 2011 Tohoku earthquake (Kato et al., 2011). Focal mechanism solutions for the majority of earthquakes prior to the 2011 Tohoku earthquake indicated reverse faulting, and are thought to have been associated with the stress field caused by subduction of the Pacific Plate. Kato et al. (2011) explained that the change in focal mechanism solution types was caused by a redistribution of the stress field associated with the large displacement related to the 2011 event. In addition, Imanishi et al. (2012) explained the increase in seismicity by a change in stress caused by the 2011 event, combined with a pre-shock normal-faulting stress regime. However, the shear-wave splitting data suggest that the polarization direction did not change significantly after the 2011 Tohoku earthquake within the area of newly-activated seismicity, with almost N-S polarization azimuths in datasets 1 and 2 in this area (Figs. 4 and 5). The average and standard deviation values of the shear-wave splitting at the seismic stations, from data observed both before and after the 2011 Tohoku earthquake, are shown in Table 1. The polarization directions at the seismic stations located in the newly-activated seismicity area are not significantly different between the pre- and post-2011 Tohoku earthquake except for the data of the seismic station N.JUOH. However, the number of data at the N.JUOH is only one in dataset1. 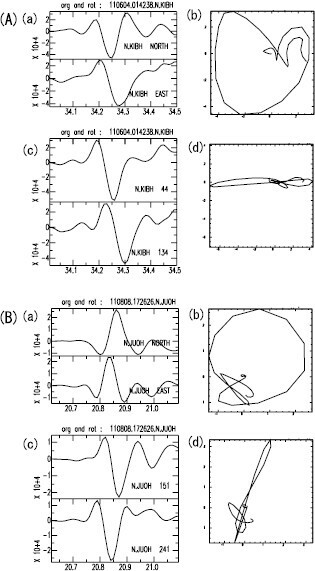 It is very difficult to mention the difference of the polarization direction of N.JUOH. The analysis of the difference of the time-lag values is very important. The magnitude of the stress might relate to the magnitude of the time-delay of the shear-wave splitting. However, the standard deviations of the values obtained were large. We consider it difficult to discuss the magnitude of the tame-lag values here. The mapping of faults in the area also suggests a NE-SW σ1 direction prior to the 2011 Tohoku earthquake (Sato et al., 1982). Imanishi et al. (2012) determined the focal mechanisms for a small number of minor earthquakes within the study area prior to the 2011 Tohoku earthquake. The lateral variation of the mechanism solutions can be seen. The mechanism solution of the earthquakes, which occurred at the western part of their research area, shows a reverse fault type. However, the normal fault type mechanism solution can be seen at the eastern part of their research area, which is consistent with the newly-activated seismicity area, though even prior to the 2011 Tohoku earthquake. This indicates that focal mechanism solutions in this area did not change after the 2011 Tohoku earthquake. Our shear-wave splitting results are also consistent with the results of Imanishi et al. (2012) and Sato et al. (1982), and indicate that the stress field in the area of the newly-activated seismicity did not change significantly after the 2011 To-hoku earthquake. Here, we consider four models that can explain a stress field in the area of the activated seismicity with a N-S σ1 direction; i.e., fracture, local stress field, gravity effect and bending models. Firstly, we consider a fracture model where shear-wave splitting is caused by pre-existing fractures within the crust. If large earthquakes that occurred along N-S striking faults had previously occurred in the area, these earthquakes may have formed large fractures in the crust, causing the crust to become an anisotropic medium. If shear-waves pass through this medium, the shear-wave will split, potentially causing the observed N-S polarization direction. Tadokoro and Ando (2002) researched processes whereby fractures associated with large earthquakes are healed. They measured shear-wave splitting in the source area of the 1995 Hyogo-ken Nanbu earthquake (M 7.3, Mw 6.9) over differing time periods. This research focused on shear-wave splitting 9–12 months after the mainshock, and determined that the faster shear-wave polarization direction was parallel to the strike of the main fault, suggesting that this shearing was associated with pre-existing fractures. However, shear-wave splitting analysis some 33–45 months after the main-shock detected a rotation in the polarization direction, with the polarization direction during this period running parallel to the regional maximum horizontal compressional stress and oblique to the strike of the main fault. This temporal change suggests that all shear fault-related fractures and tectonic stress-related cracks had completely healed and recovered between these two periods, indicating rapid fault healing that was completed some 33 months after the main-shock event. In the present study area, the last known historical large earthquake occurred several hundred years ago, and if this earthquake had caused any significant fracturing in the area, these will have been healed, with the polarization direction reflecting the maximum stress axis direction; as such, this model cannot be applied to the study area. Next, we consider the local stress field model. A strain rate distribution based on GPS data was obtained by Sagiya et al. (2000), who suggested that the area of increased seismicity was undergoing E-W or ENE-WSW compression, indicating that the polarization azimuth orientation does not match the GPS data. However, GPS-based strain rates indicated N-S compression 70 km south of the study area, potentially caused by NNW-oriented subduction of the Philippine Sea Plate under the North American Plate. The area of newly-activated seismicity defines a triangle some 50 km from north to south and 30 km from east to west, with seismic stations recording N-S polarization directions located within this area. The boundary between areas with newly-activated seismicity and N-S polarization directions, and those without is very sharp, with the western boundary of the triangle corresponding to the Tanakura Tectonic line (Nakajima, 1992) (Fig. 5). Nakajima (1997) suggested that the area of activated seismicity was associated with an area of high-pressure metamorphism, and is geologically different from the surrounding area. This indicates that the distribution of seismicity may be partitioned by the presence of numerous tectonic blocks, with the N-S σ1 stress field within the area of activated seismicity potentially being caused by local stress-field variations relating to the heterogeneous structure of this area. The gravity effect model is also a candidate. Seno (2001) pointed out that the normal fault type mechanism solutions at the central part of the mountain range could be explained by the gravity effect. In the Andes mountain range, South America, the mechanism solutions of the earthquakes which occurred at the central part of the mountain range were almost normal fault type. In the mountain range, the mass at the central part of mountain range is larger than those each side. The gravity force at the center part of the mountain is large compared with that of each side because of the weight of the mass of the mountain. The gravity-force gradient arises from the difference of the mass between the central part and each side of the mountain range. Then, the central part of the mountain range becomes an extensional stress field. The gradient of the gravity force causes normal fault type earthquakes. The Abukuma mountain range is located in our research area of newly-activated seismicity. The Abukuma region is a north-south trend of mountain ranges. The regional difference of the gravity force causes E-W tension in the center part of the mountain. The polarization direction with N-S might be explained by the gravity effect. However, some of the seismic stations with the N-S polarization direction are not located in the mountain range. It is very difficult to explain all of the data by the gravity effect. A bending effect may also cause E-W tension. In northeastern Japan, the Pacific Plate is descending to the west beneath a region of continental crust, with bending of the overlying plate caused by the drag force exerted by the subducting slab. Synthetic and experimental studies have suggested that the uplift zone was created along the trench at the overlying plate (e.g., Shimazaki, 1974; Luth et al., 2010). Normal fault was expected to be observed at the uplift zone (Burg et al., 2002). Bending models suggest that an E-W directed extensional force is expected at the hinge line of the overlying plate, meaning that an N-S polarization direction could be caused by bending. If this model can explain the observations described above, a similar N-S polarization direction should be observed in a wide N-S trending area parallel to the trench axis. This means that to determine fully the cause of the observations described above, we have to measure shear-wave splitting over a wide area along the trench. The above discussion indicates that we cannot unequivocally determine if any one of the four mechanisms can fully explain our observations. However, our shear-wave splitting analysis indicates that the large magnitude stress change to produce the significant change of the polarization direction could not be observed after the 2011 Tohoku earthquake, although the amount of seismic activity did change. It should be noted that the magnitude of time-lag values may have changed, although we did not detect a significant difference after the 2011 event. The stress field might be changed after the 2011 Tohoku earthquake. But the magnitude of the stress change is not large enough to detect by the shear-wave splitting analysis. In addition, we did not detect any change in time-lag data associated with fault healing processes. Future research should focus on identifying changes in shear-wave splitting with time, an area of research that will be able to more fully explain the mechanisms that underlie the observations presented here. We thank NIED and the Japan Meteorological Agency (JMA) for the use of their waveform data. Some of the figures presented here were made using the GMT code (Wessel and Smith, 1991) and the T-seis tool (Tsuruoka, 1997). We also acknowledge helpful discussions with Prof. Hiroshi Sato and Tetsuzo Seno. We thank two reviewers, Prof. Satoshi Kaneshima and Porf. Martha Savage, for their helpful comments.